Our next general membership meeting will feature a talk by authors Daniel Biddle and Murray Dubin about Octavius Catto (1839-1871), an important educator, athlete, and equal rights leader in the years before, during, and after the Civil War. Presented in partnership with Lawnside Historical Society, the event will be held on Wednesday September 26 at 7:30 pm at the Mabel Kay House, 24 Walnut Street, Haddonfield. Admission is free. Biddle and Dubin helped to bring Catto’s many accomplishments to light with their 2010 book, Tasting Freedom: Octavius Catto and the Battle for Equality in Civil War America. Biddle and Dubin each had long careers with the Philadelphia Inquirer, and both had previously created works touching on aspects of Catto’s life. After accidentally discovering their mutual interest in this remarkable man, they decided to work together to share his full story. 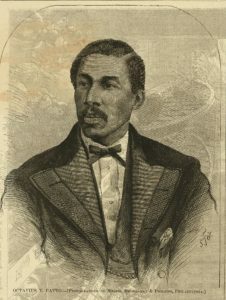 Catto worked as a teacher at Philadelphia’s finest black school and also was a second baseman in the Pythian Baseball Club, an African American team. Among other accomplishments, he led a successful effort to have Pennsylvania’s streetcars integrated and to have Pennsylvania ratify the 15th Amendment, which granted black men the right to participate in elections. He was murdered in 1871 by a member of a white mob while on his way to vote. Philadelphia recently honored Catto with a statue outside of its City Hall. Please join us on Sept. 26 to learn more about this equal rights pioneer and the men and women who worked with him to change America. Funding provided by the Camden County Cultural and Heritage Commission at Camden County College, the officially designated county history agency of the New Jersey Historical Commission. Donate any amount, including for a specific project! Add information on the donation payment page. Monday, Wednesday, and Friday 1-4 pm and by appointment. First Sunday of the month 1-3 pm. Tuesday and Thursday 9:30-11:30 am and by appointment. First Sunday of the month 1-3 pm. Click here for our inclement weather policy. Greenfield Hall and the Archives Center are both CLOSED Saturdays & Sundays except as noted above for the first Sunday of the month. We are closed in August, on major holidays and the week between Christmas and New Year’s.